Santa brought [Quinten’s] son a shiny R/C truck for Christmas, but this new toy had one drawback – its batteries could only be connected to the charger for a maximum of 6 hours, lest he turn his house into a pile of smoldering ash. With grave warnings from the manufacturer dancing in his head, he searched around for a timer that would allow him to cut power to the battery after charging for its allotted time. 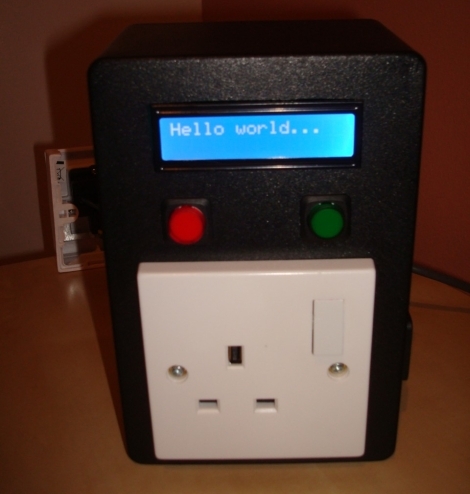 Coming up empty, he decided to create his own timed electric socket regulated by an Arduino he had sitting around. He grabbed a project box and wired up a nice looking socket timer, complete with an LCD status display. To make things easy for his son, he added two buttons to the front of the controller – one for selecting the amount of charging time, and one to set the timer in motion. As with his previous hacks, [Quinten] has provided plenty of documentation in the form of pictures, code, and even a video of the timer in action. Interestingly enough, a timer socket such as are used for automating home lights and such would have worked perfectly for this. Still, that’s quite cool. With a lot of chargers, the battery will discharge back through it when it is turned off and the battery left plugged in. Seconding arfink: a $5 plug-in timer would’ve done just fine for this. It’d also entail less risk of accident or error when dealing with mains power, which is always a plus. On the other hand, it’d probably be hard for a younger kid to operate one of those, and this is inarguably nifty. However it seems like it would have been a better effort to fix in the charger to keep it from being a freaking fire trap. I can’t believe that a charger like that is allowed to be sold. Especially in what’s ostensably a children’s toy. Just get a time delay relay. Purpose built for this and would turn off power post mains rather than the whole system although that wouldn’t hurt either – time delay relays are rated to carry that much current (which in this case is very small by most industrial standards where 10 – 20 amp is considered small). I built a similar device for my brother. One night we found he had fallen asleep on the carpet and had forgotten to turn off his hot glue gun, which was lying on the bed. So I built him a similar device (similar in function, not design) that would stay on for about 10 minutes unless he kept hitting the reset button. yeah this thing is a good way to destroy your batteries charge for 6 hours, ignore for 20 while the battery discharges back in to the transformer, drive car for 2 seconds, rinse, repeat. You can buy smart chargers with over charge prevention for less than the cost of an arduino or you can spend 300 for the nice ones(that will even do maintenance operations for you) but this is by no means a hard to find feature just google “NiMH smart charger 7.2v” I own the same RC you can use the same chargers as the big 7.2 packs it should have came with a molex adapter. Or to fix your design put the relay in line battery on the low voltage side of the charger and add a voltage sensor stop charging take a reading if its under 8.4V continue charging. 1. I would have only worked on the low voltage side. 2. A thermal sensor for the battery overheating would be nice if you really don’t want to start a fire! 3. A smart charging circuit to see when you’re over charging the battery. 4. And a relay disconnect to take the battery out of the loop completely when its charged or becomes too hot. If the truck is using a nickel-based battery, then leaving it on for more than 6 hours isn’t going to explode anything. If it uses a Lithium-polymer battery, then it most certainly has a charger capable of figuring out when the battery is full, because otherwise it’d catch fire long before six hours passed. My guess is simply that whoever told you the six hours thing doesn’t know a charger from an iron. At least, I surely hope so – the alternative is that they’re knowingly selling a LiPo-powered truck with a dumb charger, which is probably grounds for dragging them into a criminal court. All that said, if you want to charge LiPo batteries in the safest way possible, a smart charger (available for as low as €40, though better ones cost more and are a good idea) is a much wiser investment than any homemade contraption. Note that in a pinch it’s possible to charge LiPo batteries safely using a bench power supply that can be regulated in both voltage (set it to precisely 4.2V; if precise settings are not available set it to 4.1 – better safe than sorry) and current (set it to half the battery’s capacity for a nice and safe 1/2C charge level). But the real issue at hand is overcharging the batteries. A time-limited charging device does not prevent overcharging unless the batteries are drained to a safe level. You need to read the voltage that is ramping up while charging, and cut it when you reach a prescribed maximum. Given the fact that the charger/batteries have no sensing circuit to prevent over charging, it’s a safe bet that the batteries will discharge through the charger, and at a much faster rate than actually using the batteries in the intended device. Nice project, but would of been better applied to the line between the batteries and the charger. Soldering iron + paper = fire. Hot glue gun less likely. This is why I only solder in a room made entirely of metal. Pretty good chargers with built in sensors are cheaper than the Arduino he used. If the battery is half empty then it will start to heat up after only 3 hours of charging. Those slow chargers (everything that takes more than hour or two to charge a battery) can not under normal circumstances turn his house into a pile of ash. nice job , timer chargers for various battery types nice ones run about 50$. You should also consider checking out your local hobby shop and inquire about peak chargers. You will need to know the type of battery chemistry you have (nicad lion etc). Depending on what batteries you have there are opposing rules on how to care for them. For instance if they are nicad you should have a discharge bar (light bulbs soldered together with a battery clip on it) and discharge it after draining it with the car. Then you should run it threw a nicad peak charger, and probably not more then once per day. Other types of batteries are the exact opposite where you should never ever drain them completely. PS regardless of what type of batteries you have invest in a small fan to cool it down after each discharge/charge/run Heat is the biggest threat to battery life time and or performance. Ive been racing those rc cars for about 15 years hehe. Ps inquire whether your battery chemistry should be stored (1 month periods) charged or discharged. This is also an opposing rule depending on what type of battery you have and can dramatically effect the performance of the pack. Not to troll or anything, but I really think that building a nice custom charger would have been better than building a timer for the included crap charger. There are already plenty of smart battery charging ICs out there. @o: He used an arduino. He probably doesn’t even know datasheets exist. And you expect him to make a custom charger? Please. A lamp timer with a splitter. One outlet powers the charger, the other an AC relay. Connect the relay contacts to the charging circuit. When the timer trips it opens up the mains as well as the charging line and isolates everybody from each other. Ya I know how that the glue gun won’t start a fire under most circumstances. A little 25W soldering iron comes closer but usually burns and chars instead. It’s the fact that he left it powered on on his bed scared my parents. So I built a timer with what was effectively a dead-man’s switch. agree with arfink, a $5 timer would have done the same thing. Just pull out 6 hrs worth of notches, and then spin the dial to the top to start the charge. I still like the idea though. The quality of the writeup is good, more projects on here should be this thoroughly documented. Now if all the insecure alpha-nerds could calm down in the audience, that’d be great. Show us how to make an intelligent battery charger rather than vaguely waffling about it. Be specific, using as much detail as this project did.